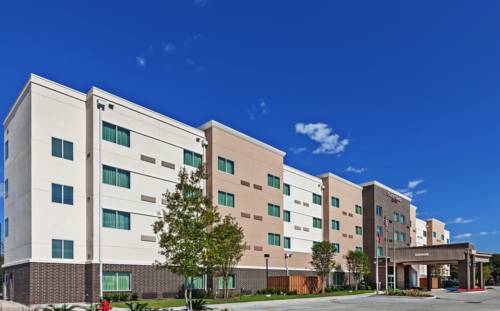 Enjoy convenience and comfort when you stay at Courtyard Houston I-10 West/Park Row. After a night of entertainment in the nearby Energy Corridor or at CityCentre, return to our hotel's spacious accommodations with modern amenities to get recharged. In the morning, grab a hot cup of Starbucks coffee and a healthy breakfast at our on-site restaurant, The Bistro, also open for dinner. If you need a midnight snack, stop by The Market, open 24 hours. Get in a workout at our fitness center, or lounge on our outdoor patio near the pool. Need to stay productive? Complete your business in our meeting venue equipped with AV equipment, or utilize the spacious workstation in your room or suite. In downtime, stream or download the latest movies using our free high-speed Wi-Fi, available property-wide. Whether you are visiting the Texas Medical Center West Campus, only steps away, or exploring the rest of H-town via Katy Freeway, let Courtyard Houston I-10 West/Park Row take care of your travel needs.